This North African country was the first to acknowledge the independence of the United States of America. * In 1777, seeking to expand foreign trade, the country’s sultan opened his ports to several European countries with which he did not have treaties, and to the brand new nation of the USA. In treating the United States just as he did partner countries with formal agreements, he legitimized its independence. The Americans were focused on their revolutionary war at the time and it took a few years for a proper response. Ultimately, a Treaty of Peace and Friendship was signed by both nations in 1786. Although renegotiated some 50 years later, this treaty is still in effect and is America’s longest standing treaty. *France was the first to formally recognize US independence by treaty, in 1778. This mystery country is Morocco. 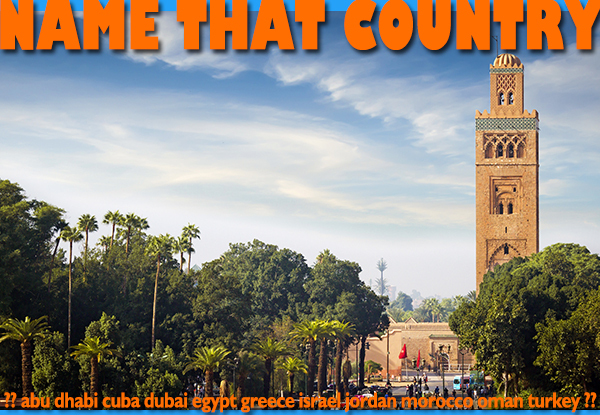 This entry was posted in Morocco, name that country quiz and tagged Morocco by yalla2013. Bookmark the permalink.